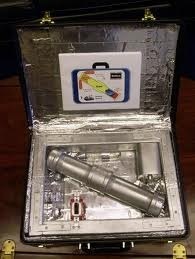 They are actually referred to as Special Atomic Demolition Munitions (SADMs) or Nuclear Suitcase Bombs. The designs for these weapons do exist, however due to the fact that the isotopes required to make them are radioactive (plutonium or uranium) the person(s) assembling it would have already received a fatal (or near fatal) dose of radiation poisoning while putting it together. The next question that comes to mind usually is "just how powerful are these things?" The answer is (hold on to your hats) that they are just as strong as the one that was dropped on Hiroshima (4 kilotons). For more information on these things you can check out the links I have added below. Note: The great wiki has been altered with the removal of the pictures and key information that is contained in this post.